We decided to go out onto the balcony this evening to water the plants. As soon as Pot Plant Owl left the nest, we set off under the protection of an umbrella. One holds the umbrella and watches for incoming, silent attacks, while the other one holds the watering jug and carefully waters the side of the container away from the eggs. 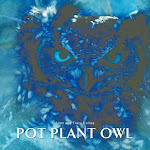 There are two eggs now and it looks like Pot Plant Owl will lay at least another one egg.